I just checked out your site to see "Ur-Sema Du and Kai Justiss vs. Marsh Haunt!" Great stuff! Great Site! Can you share the story/inspiration on this one (from your) Star Wars RPG Art gallery? Whew Whew!!!! Thanks, Enrique! For the 'Power of the Jedi Sourcebook' (published by Wizards of the Coast) I was required to illustrate a series of scenes focusing on creatures for a particular chapter of the book. I planned to treat them all like action scenes with Jedi (except for the Beck-tori sea monster which just beckoned for me to draw Jar-Jar, one of my favorite characters to draw actually). 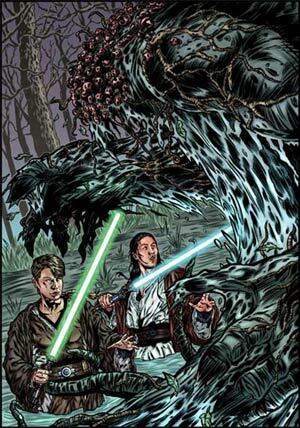 The Marsh Haunt was a pretty dynamic monster the way it was described in the art notes so I thought it would be cool to have the extra ferocious beast facing down not just one Jedi (like in my Jackobeast art) but two instead. I had my own Expanded Universe character, Kai Justiss, who I created previously for some of my art in Star Wars Gamer magazine, that I wanted to use as the protagonist for these series of illos. I also decided to draw my friend, Jan Duursema, as a Jedi (since I often feel like the 'Padawan' to her 'Master'). For this illustration I made her character, Ur-Sema Du, Kai's Jedi Master (subsequently, as much as Jan was flattered about the idea and did approve beforehand, she killed her own Jedi 'self' off in the Star Wars Episode II comic book adaptation during the arena battle on Geonosis. You can spot the lifeless body of her character somewhere in the carnage of the panels). Also, with a monster called 'Marsh Haunt' and me being a Swamp Thing fan from days gone by, there's some definite Berni Wrightson influence from me in this piece too. This particular illustration of the series was actually the most difficult to execute in terms of composition for me. I was really struggling with the delicate balance of showcasing my Jedi heroes clearly but still keeping the emphasis on the massive creature. I actually had help from my pal, Kai Justiss himself - Justin (a talented artist and designer in his own right), who gave me some advice on where to position the characters and emphasize the dynamic pose of the monster. It was difficult at first for me since I really wanted the likeness of my two characters to be noticeable at the forefront but I still had to convey and contrast the sheer size of the large creature against the Jedi. I didn't want either the Jedi or the monster to go too small so it was a very delicate balance of sizing and positioning to get the Jedi as large and as detailed as I preferred them to be and still treat the monster as menacing and as behemoth-like as possible. So I went through a number of thumbnail sketches before I got this one right. And preliminary sketches, no matter how many it takes are always key to obtaining a successful design to any composition. Sometimes, I can knock out the scene in one or two thumbnails since I'll have it pictured perfectly in my head after I read the script or art notes. Sometimes, it may take me ten or twenty thumbnail sketches before I nail down what's required for the scene. But since I draw these very small and design really basic with simple shapes representing the figures, objects, background etc. of the composition it allows me to be very efficient. I even approach an entire comic book page in this format after reading a script so even if I have to draw ten or twelve thumbnails I can usually do them all in ten minutes if not quicker. 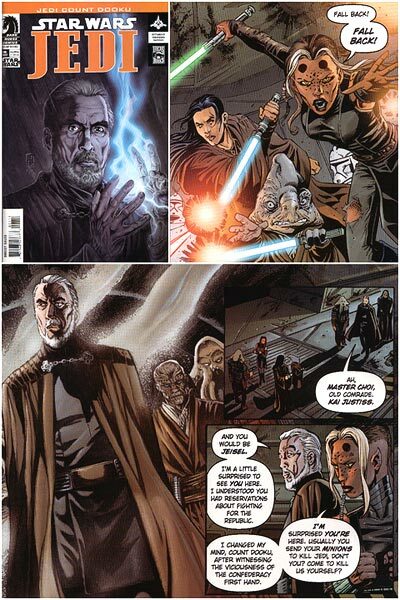 By the way, my Star Wars Expanded Universe character, Kai Justiss, just made his first Star Wars comic book appearance in Jan Duursema's and John Ostrander's 'Star Wars Jedi: Dooku' from Dark Horse Comics. This is by far some of Jan's best work yet. Her work is always consistently great but her work in 'Dooku' is just magnificent. And it's one of the best Star Wars stories she and John has created so far. Do yourself a favor and check it out right now since it's currently on sale and in comic book shops everywhere. Then feel free to drop by her official message board after your jaw has hit the floor just to let her know what you think.